the mistakes advertisers make in their TV productions In the five years we have been assessing and auditing television productions there have emerged three common ways advertisers drive up the cost of their television productions. Unfortunately, in almost every case, the advertisers concerned were unaware of the impact their processes and behaviours were having. 1. Outcome expectations Imagine you are building a house. Would you give the architect a budget to work with? Would you outline your expectations in style and function? Or would you just let him go creatively crazy and hang the expense? Implications If you brief your agency give them a budget and tell them you want them to stick to it. Tell them all of the objectives you want the commercial to achieve. Tell them all of the ways you are going to use it, where, for how long, and on what media. Case study A client gave the agency a $300K budget and a brief to ‘lift creativity’. The agency interpreted that as ‘lift the budget’. Following three months of creative development, concept testing and international approvals, the agency presented a big idea with a cost of over $600K. 2. Making changes Imagine walking into a house you are having built and telling the builder you want to move a wall here or add a room there. In the building industry these are known as ‘extras’ and are a rich source of profit for the builder. Implications The same applies for the television production industry. Once the production commences, (ie after the final pre-production meeting) every change costs you money. If you make changes and it doesn’t cost you money, then you know the agency and/or production company has built plenty of contingency into the cost. Case study A client briefed their agency to develop a television campaign and nearing the completion of post-production announced the packaging had changed significantly. The cost of including the new packaging added 20% to the total production cost. 3. Approval Processes Imagine turning to the builder once the house was finished and saying, “Well. I guess it’s time to get council, electrical, plumbing and planning approval”. Especially when you know most of them will want changes and one may reject the overall plan altogether. In extreme cases, clients have been known to race back to the agency to make changes as they go through each level of final approval. Each set of changes costs money. 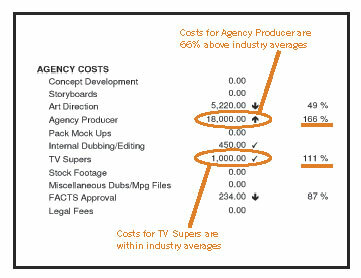 Worse still, the agency gets to know this is your preferred process, so they hide a cost contingency in to cover it. Either way, you pay big. “Knowledge is power” and the new 68 page P3 Advertising Performance Manual is full of information on the expanded services offers by P3 to help advertisers achieve maximum value from their advertising budget. As a subscriber to the P3 e-news you will receive a copy free by mail in the first week of November. However, if you would like additional copies or know of someone not on our email list, go to www.p3.com.au and click on the subscribe link.